Shaggy Mane (Coprinus comatus). Known also as the Shaggy Ink Cap and Lawyer's Wig. This is my personal favorite mushroom. Kit search on the web here (Google search) and here (Bing search). 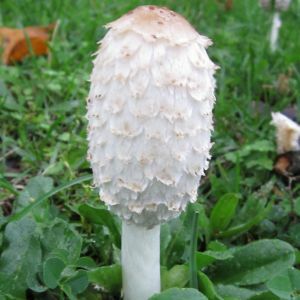 How to grow Shaggy Mane mushrooms here (Google search) and here (Bing search). Due to the fantastic flavor, and nice texture, I think these would be a big seller but for one problem: you have very little time to cook them after picking before they start to deliquesce. That is a term for turning to liquid. It is part of their reproductive strategy to liquefy to spread their spores (seeds). Pick, and take right to the stove. Only pick the young ones that are still egg shaped on the top. Once the top becomes bell shaped and the bottom edge of the bell is black, you are too late. Because of the limited time between picking and using, this is a great mushroom to grow at home. Pick just before you are going to cook them. Use them in soups, stir-fry's, baking – whatever. Stir fried with onions and garlic in grape seed oil served on dry rye bread toast is my personal favorite. Cap Morphology: Ellipse/cylindrical to egg shaped when immature to conical when mature. Covered with scales like up turned shingles on cap surface that give it a shaggy look. White, but center can be light brown now and then. Flesh is white and very soft. Scales can have light brown edges. If bell shaped, will be black and liquid at the very edge. Spore Bearing Surface: Very closely spaces gills on the underside of the cap. When very immature the gills are nearly white, then turn pinkish. When fully mature - black and liquid inky. Only eat specimens that the gills have not turned black, or cut off the areas where the gills are black. Spore print: Blackish brown, but hard to get a spore print. Stipe (Stalk): Hollow or with a pith that will easily separate - and this is a key characteristic to differentiate it from the Destroying Angel. Can see an annulus, but often it has slid down the stalk to the base or is not seen at all. Partial Veil: Yes, only seen before the cap takes the conical shape. Partial veil can leave a ring or skirt on the stalk, but often it slides down to the bottom of the stalk. Habitat: All over, but not in woods. Grassy areas, open areas of woods, very often near roads and paths, disturbed areas, the year after fresh sod is placed. Notes: My personal favorite mushroom, just be careful and enjoy. Sometimes found one at a time, sometimes in huge numbers. 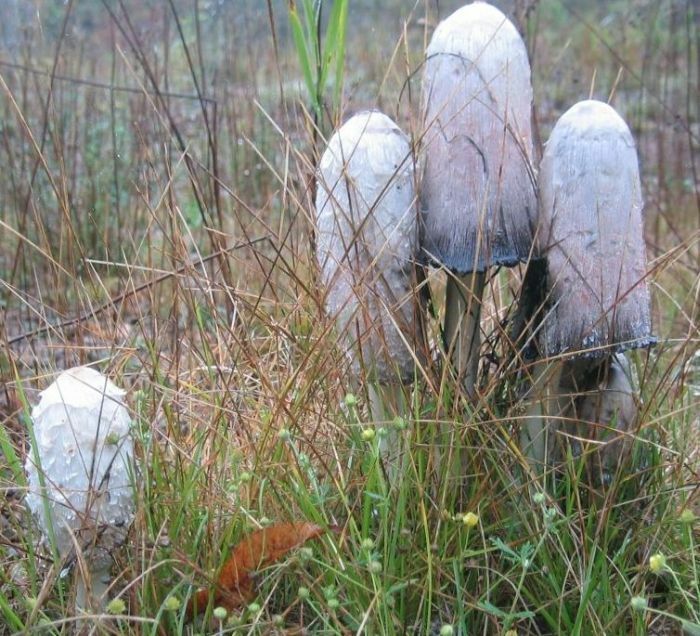 The Shaggy Mane (Coprinus comatus) on its own to the left is perfect for picking and cooking. Notice how the egg shaped cap has a “shaggy” look – it is not smooth. Now look at the tall group of three to the right with a couple more in behind. The tall one on the left is still good, but getting late, and the other two tall ones are too late – they have turned bell shaped, black on the bottom of the cap and pinkish in the center.